The month of October is upon us, which means two things are popping up in stores near you: 1. Pumpkin spice flavored everything and 2. Halloween candy… Lots and lots of Halloween candy. Candy-centric holidays such as Halloween can be difficult to navigate when you’re a health conscious mom like myself. I want my kids to enjoy their fair share of Halloween goodies, but that doesn’t mean that every Halloween treat needs to be a fun sized candy bar. So whether you’re looking for a themed treat for your kids to enjoy at home or to share at their classroom holiday party, these snacks are sure to be spooktacular! Spiders on a Log: Similar to ants on a log with celery, peanut butter and raisins, add googly eyes or plastic spiders to the “log” instead of the dried fruit! 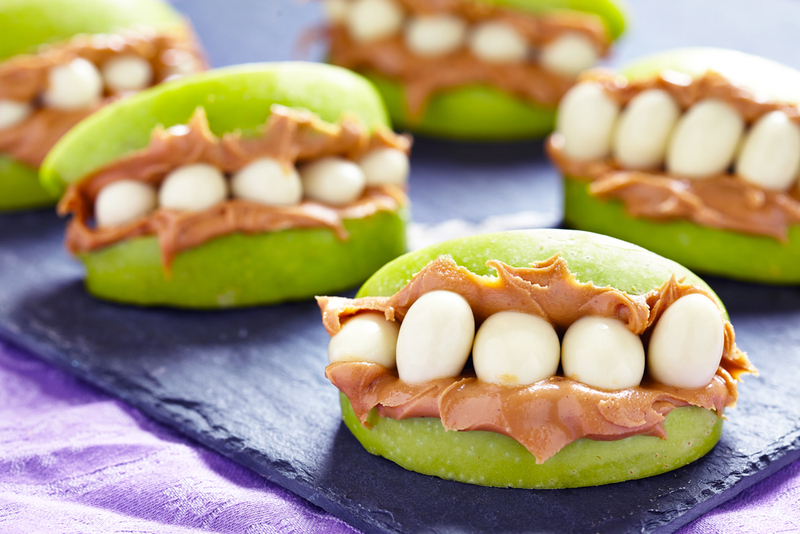 Apple Peanut Butter Teeth: A fun, easy snack that can be made with any nut butter or apple variety! Clementine Pumpkins and Banana Ghosts: The perfect Halloween treat for the classroom or post-game snack! Jack-o-Lantern Fruit Cup: Another kid-friendly snack that takes little to no time of prep for Mom and Dad. Candy Corn Fruit Parfait: This would be a fun breakfast for Halloween morning or makes a delicious snack post trick-or-treating!